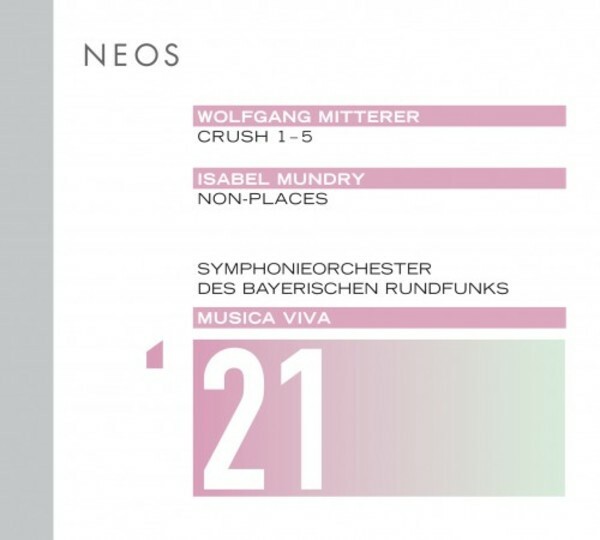 Two extraordinary keyboard virtuosos are in the foreground of the course of orchestral events, as always being sovereignly presented by the Symphonieorchester des Bayerischen Rundfunks conducted by Peter Rundel (Mitterer) and Emilio Pom�rico (Mundry). Wolfgang Mitterer, an East Tyrolean born in 1958, has made himself a name not only as a composer, but also as a witty performer on his instrument, the organ. In his extensive composition 'Crush 1-5', he himself therefore takes the role of the improvising soloist, who in a most virtuosic manner transcends the electronically extended orchestral part. The second virtuoso is Nicolas Hodges, an internationally highly respected pianist especially in the field of today�s music. In this live recording he dedicates himself to the finely carved soundscapes of Isabel Mundry�s second piano concerto, 'Non-Places', of 2012. According to the composer, it represents an attempt to musically capture the scenery of an airport, a strange 'non-place' between bustling activity and the solitary state of waiting.